This wine village of Termeno is the hometown of the famous Gewuerztraminer wine. Termeno sulla strada del vino, or Tramin an der Weinstrasse in German. The main square in Termeno’s centre. Lake Caldaro seen from Termeno. In the village of Termeno. Vineyards at north of Termeno. Both, white and red wine grow in the area of Termeno. The new winery of Termeno. A mountain biker riding down from Mendola mountains near Termeno. Termeno in winter with Roen mountain and Dolomiti di Brenta. The many information panels that are found along the trail, will satisfy the curiosity of hikers interested in the fauna, flora and geological artefacts along the way. This makes the Termeno Nature Discovery Trail, something special for all ages. The „Winzerwanderwoche“. This hiking week is a secret tip for those wanting to experience nature first hand. Hiking groups make their way through the colourful landscapes that the South Tyrolean Autumn has to offer. 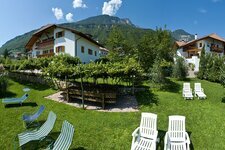 Termeno at the South Tyrolean Wine Route is a municipality with 3,269 inhabitants in the South Tyrolean Bassa Atesina. The wine village is surrounded by gently rising hillside vineyards and is characterized by the rhythm of life of the local people. 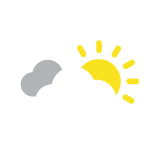 Come with us and enjoy a day full of good mood in Termeno. In Termeno the spring starts very early. The mild climate and the mediterranean vegetation are the ideal condition for this. 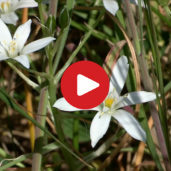 Today we wander through the nature of Termeno and enjoy the spring blossom. A leisure cycling tour through the landscape. The South Tyrolean Bassa Atesina area around Termeno can be discovered with great relish. Accompanied by a local guide this bicycle tour proceeds through vineyards and orchards, along little frequented cycle paths. At the same time we learn a lot about the country and its people and about typical products. 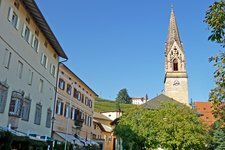 The village of Tremeno, famed for it’s Gewürztraminer and excellent wineries invites visitors to experience the village way of life every Wednesday. Together with music, a glass of wine, traditional arts and crafts and a game of chess in the village square, one can browse shops and get served local delicacies. With nostalgic, horse drawn carriage rides through the village together with a gallant display by the local fire brigade, visitors will be transported back in time to the “good old days”. 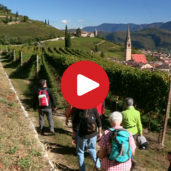 Termeno is the home of the world-famous South Tyrolean Gewurztraminer. Like the wine, also the people here are characterized by the alpine Mediterranean landscape and possess a special spice. 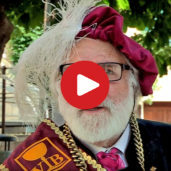 Some of them even founded their own state in 1994, the state of the “Vinobarden”. Come with us and follow this peculiar story of Termeno! The mediterranean flair of Termeno on the South Tyrolean Wine Route and its surrounding landscape, from a bird’s eye perspective. 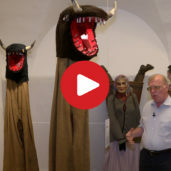 When men wear women‘s clothing and start drinking „Braut“ schnapps, the strange and quirky marriage of „Egetmenn Hansl“ is celebrated in Termeno. The „Egetmann“ procession is one of the oldest and entertaining Carnival processions in the region of Tyrol. This event takes place once every two years and attracts over ten thousand visitors from all over. 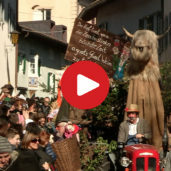 Many Alpine villages have abandoned this tradition however in Tremeno, it is still well and alive! About 5 km in the south of Lake Caldaro, there is the sunny wine village of Termeno, located at an altitude of 276 m asl. Termeno includes the component localities Sella, Ronchi and Termeno village and boasts a number of inhabitants of about 3,000. The surroundings of the village are characterised by gentle hills covered by vineyards. However, Termeno is above all famous for the grapevine of the Gewuerztraminer and the homonymous wine. You already might be familiar with this flavoursome white wine. Several events make your stay in Termeno even more varied: either the so-called “Egetmann parade” in Carnival, the vintner hiking weeks in summer or the harvest period in autumn, all seasons have their highlights. Moreover there are several places of interest you should not miss to visit.